&###x200B;&###x200B;&###x200B;&###x200B;&###x200B;&###x200B;&##x200B. Top Brands - Lowest Prices. CENTRAL HEATING RADIATORS HIGH QUALITY 10 YEAR GUARANTEE ALL SIZES AVAILABLE. TYPE 11 = &###xA0; &###xA0; SINGLE PANEL & SINGLE CONVECTOR. TYPE 21 = &###xA0; DOUBLE PANEL & SINGLE CONVECTOR. TYPE 22 = DOUBLE PANEL & DOUBLE CONVECTOR. ALL FITTED WITH TOP & SIDE PANELS. COLLECTION ONLY ON THESE ITEMS FROM OUR BRAINTREE SHOP. CALL OUR SHOP FOR MORE DETAILS OR TO ARRANGE A COLLECTION&###xA0; 01376 617040. The &###xA0;K-Rad Collection of radiators will enhance any home with space saving classic elegance and efficiency. Comprising over 210 sizes, they. Are manufactured using the latest state-of-the art technology ensuringmaximum efficiency. Internally welded with a final coating of white enamel (RAL9016) each radiator is degreased and zinc phosphated before being coated with water-based cathophoratic paint. Is applied using an epoxy polyester&###xA0;electrostatic powder coating system that is baked to a hard finish. The K-Rad Collection of radiators will enhance any home with space saving classic elegance and efficiency. Comprising over 210 sizes, they&###xA0;are manufactured using the latest state-of-the art technology ensuring&###xA0;maximum efficiency. Internally welded with a final coating of white enamel (RAL9016) each. &###xA0;radiator is degreased and zinc phosphated before being coated with water-based cathophoratic paint. You also have the protection of our &###x2018;Kartell No Quibble Guarantee&###x2019; against faulty manufacture which lasts for 10 years. All radiators come complete with factory fitted top grille and side panels. Everything required for installation can be found within the robust packaging. Brackets are of a strong design, with open top and deep slots, which facilitates easy and secure installation. Plastic inserts seat the radiator precisely on the bracket minimizing&###xA0;expansion and contraction noise. The neat nickel-plated plug and vent provide a watertight joint, whilst complementing the superior finish. &###xA0; &###xA0; &###xA0; &###xA0; &###xA0; &###xA0; &###xA0; &###xA0; &###xA0; &###xA0; &##xA0. COLLECTION ONLY FROM BRAINTREE ESSEX &###xA0;CM7 3AN. Any product you return must be in the same condition you received it and in the original packaging. Comprising over 210 sizes, they are manufactured using the latest state-of-the art technology ensuringmaximum efficiency. The final coat is applied using an epoxy polyester electrostatic powder coating system that is baked to a hard finish. Comprising over 210 sizes, they are manufactured using the latest state-of-the art technology ensuring maximum efficiency. INSTALLATION everything required for installation can be found within the robust packaging. Plastic inserts seat the radiator precisely on the bracket minimizing expansion and contraction noise. 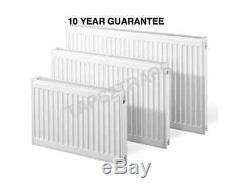 The item "CENTRAL HEATING RADIATORS HIGH QUALITY 10 YEAR GUARANTEE ALL SIZES AVAILABLE" is in sale since Wednesday, March 19, 2014. This item is in the category "Home, Furniture & DIY\Heating, Cooling & Air\Water Heaters & Boilers". The seller is "taps2traps" and is located in Braintree, Essex. This item can't be shipped, the buyer must pick up the item.